Stormé DeLarverie, a gay rights activist best known for her part in the Stonewall uprisings, was born in New Orleans, Louisiana in 1920. She celebrated her birthday on December 24, but she was not certain of her true date of birth. Stormé was born to an African American mother who was a servant to a white homeowner, her father. DeLarverie grew up in the South but eventually her parents married and the family moved to California. DeLarverie spent the years between 1955 and 1969 as the MC of the Jewel Box Revue, a touring variety performance showcasing both black and white entertainers. The revue featured men dressed in drag while DeLarverie was the only male impersonator in the show. Notably, the Jewel Box Revue was the first integrated drag revue, and drew crowds of both black and white audiences, even performing at the Apollo Theater in Harlem. DeLarverie is best known for possibly throwing the first punch of the June 27, 1969 uprising at Stonewall Inn in Greenwich Village. While some witnesses say that DeLarverie threw the first punch, and she made the claim as well, there were many people involved in the uprising which made it difficult to determine who the instigator was. Either way, DeLarverie was a large part of what is seen as the catalyst for the protests that set off the gay rights movement. DeLarverie was opposed to calling Stonewall a riot: “a rebellion, an uprising, a civil rights disobedience,” she said, but definitely not a riot. Two weeks after the rebellion, DeLarverie was part of the official formation of the Stonewall Veteran’s Association on July 11, 1969. She was active in the organization, holding the offices of Chief of Security, and Ambassador. From 1998 to 2000, she served as the organization’s Vice-President. DeLarverie participated in the organization, and was a regular part of the pride parades in New York City, New York and other locales for the rest of her life. From the 1980s through the 1990s, DeLarverie worked as a singer and a bouncer. She patrolled gay clubs and bars on lower Seventh and Eighth avenues on the lookout for intolerance. She lived at the famous Hotel Chelsea throughout this period, and continued her vigilance against anti-gay and anti-black prejudice until she was 85. On June 7, 2012, Brooklyn Pride, Inc. honored DeLarverie at the Brooklyn Society for Ethical Culture. She was also featured in a film directed by Michelle Parkerson: Stormé: The Lady of the Jewel Box. On April 24, 2014, DeLarverie was honored by the Brooklyn Community Pride Center for her “fearlessness and bravery,” and was presented with a proclamation from New York City Public Advocate Letitia James. After a long struggle with dementia, DeLarverie died in her sleep on May 24, 2014 in a Brooklyn nursing home. She was 93 years old. William Yardley, “Stormé DeLarverie, Early Leader in the Gay Rights Movement, Dies at 93,” New York Times, May 29, 2014, https://www.nytimes.com/2014/05/30/nyregion/storme-delarverie-early-leader-in-the-gay-rights-movement-dies-at-93.html; Trish Bendix, “Stormé DeLarverie passes away, the community loses a legend,” After Ellen, May 27, 2014, https://www.afterellen.com/people/218088-storme-delarverie-passes-away-the-community-loses-a-legend; “K. 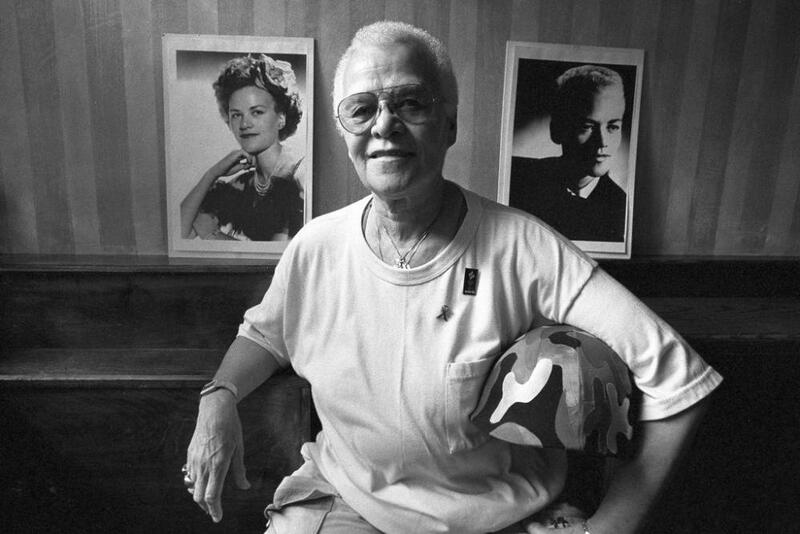 Stormé DeLarverie,” Stonewall Veterans Association, http://www.stonewallvets.org/StormeDeLarverie.htm.